Herring from the Baltic Sea, also called the "silver of the sea," supported entire European nations during late medieval times. This fish is used primarily in Scandinavian, German, Polish and Russian cuisines. Its presence in many contemporary bagel stores can be credited to its use by Ashkenazaic Jews in those countries. Herring is often kippered, chopped, smoked or salted before being canned in oil. It is served in salads, on bagels, in appetizers and in traditional dishes. Herring has raised some safety concerns. In April and May of 2010, domestic-farmed herring producers in the U.S. received warning letters indicating that their "pickled herring products are adulterated in that they have been prepared, packed or held under insanitary conditions" that were unhealthy. Although specific contaminants were not mentioned, various practices that favor the growth of pathogens and formation of toxins were described, such as improper temperatures and unclean handling. Eating herring that is caught in the open sea may be a better practice, at least in the short term. Unlike older predatory fish, mercury and polychlorinated biphenyls (PCBs) are not found in appreciable concentrations in herring caught in the open sea, so the FDA's warnings to pregnant women do not apply to this fish. A 100-gram serving of herring packed in oil has 489 calories and 34.6 grams of fat. While an occasional piece of herring in a salad won't do any damage, these numbers mean that eating canned herring as an entree could derail your attempts to keep your calorie count down. Portion control is very important with high-calorie, high-fat foods such as canned herring. The USDA recommends that calories from fat make up no more than 20 to 35 percent of all your daily calories. The fat in canned herring supplies 311.4 calories, or 15.57 percent of your daily intake of calories. If you are sedentary or moderately active, the amount of fat in this food could be unhealthy for you. Herring is rich in vitamin A. With 1,300 IU of vitamin A, a 100-gram serving of smoked herring supplies 43 percent and 56 percent of the recommended daily allowance of vitamin A for adult men and women, respectively. Vitamin A is important for night vision, and vitamin A deficiency is the leading cause of preventable blindness among children in developing nations. Vendors are not required to label food with information on omega-3 fatty acids. While the specific content of fatty acids in a serving of canned herring remains unknown, the American Heart Association recognizes that herring is high in eicosapentaenoic acid and docosahexaenoic acid. EPA and DHA are omega-3 fatty acids that reduce the risk of heart disease. 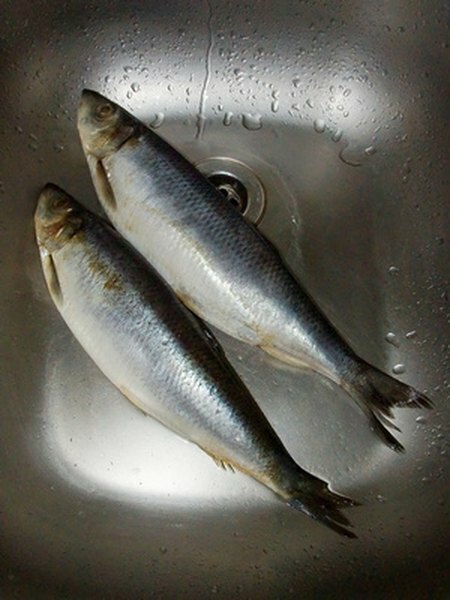 A 100-gram serving of herring has 684 mg of phosphorus. Patients with advanced kidney disease whose phosphorus intake is restricted should discuss this food with their nephrologist or their renal dietician before eating even small quantities of this food, since it is so high in phosphorus. High levels of phosphorus can be dangerous for these patients because the excess phosphorus can pull calcium out of bones. A 100-gram serving of canned herring packed in oil supplies 44.5 grams of protein. The USDA recommends that adults consume 0.8 grams of protein for every kilogram of body weight. This means that a serving of herring satisfies 95 percent of a 130 lb. woman's daily need for protein. While you may want to avoid eating an entire serving of herring, small tidbits found in a salad can go a long way towards meeting your protein requirement.